Shop with house above. C17 timber frame partly exposed to rear and with one beam and brace to front. Refronted late C18. Colourwashed brick with partial band courses at first and second floor levels. Hipped roof, slate to front pitch, remainder tiled. Brick stack to right. 3 storeys, one bay. Shop front with door to left. Upper floors have barred sash windows with cambered heads. Passage to left. Manor Court: Michael Norman surrendered the south part of the messuage in Winslow in which he now lives from "the entry" towards the south containing "A Bay of building" next to the street, and 3 "Bayes of building" adjoining on "the yard side", with the south part of the yard as now divided, containing in width 13½ feet at the west side, 6½ feet at the east side, with free ingress etc. in and through "the entry" and in and through the "gatewaies" belonging to the east part of Michael's yard with horses, carts and carriages at all opportune times. To the use of John Blechly gent. and Emma his wife and the heirs of their bodies, and for want of such heirs to the use of the survivor's heirs in perpetuity. Rent 8d, fine 5s. Manor Court: John Greene and Emma his wife surrendered a messuage in Winslow in which John now lives, with privileges of ingress etc. It was surrendered by Michael Norman deceased to the use of John Bletchley gent. deceased, Emma's late husband, as by copy of court roll bearing date 19 April 1664 appears. To the use of John Duncombe of East Claydon, who sought to be admitted tenant. Fine 5s. Procedure of common recovery. All surrendered the messuage to the use of John and Emma Greene. Rent [blank], fine 5s. They then surrendered it to John Duncombe on condition that if they pay him £42 on 27 Oct 1684 the surrender will be void. Manor Court: John Duncumbe esq. sought to be admitted to a messuage in Winslow in which John Greene now lives, with such privileges of ingress etc. as appears in a surrender by Michael Norman deceased to the use of John Blechly deceased, late husband of Emma Greene now wife of John Greene. They came into the lord's hands by surrender of John and Emma Greene enrolled at the court on 26 Oct 1683. Seisin was granted to John on condition mentioned in the surrender. Rent [blank], fine 5s. 1699 A manor court entry refers to this as "the tenement in the occupation of Joseph Ayres and lately John Greene"
1710 Manor Court: Joseph Dandridge and Martha his wife, John Strutsbury and Elizabeth his wife surrendered the messuage newly built by John now in the occupation of William Shelton or his assigns, abutting on The Kings head on the north side, the common street of Winslow on the west, with free ingress etc. in and through the "gatewaye" at the east end of the yard of the Kings head and once Michael Norman deceased's with horses, carts and carriages at all convenient times. The messuage was formerly acquird by Joseph and Martha from John Green and Emma his wife, John Stutsbury and Elizabeth his wife, Emma's daughter and heir. Procedure of common recovery followed. Rent 8<d>, fine 5s. Joseph and Martha then surrendered (with other property) to the trustees of William and Robert Lowndes. 1730 In a manor court entry concerning the adjacent property, this site is described as "the structure and ground in the occupation of James Budd and Benjamin Saunders"
1887, 31 Aug Death of George Kennings, saddler and harness maker, aged 74. Administration of his will was granted on 5 Jan 1888 to his son Frederick Kennings of Winslow, saddler and harness maker. Personal estate £290. The old tradesmen of Winslow are getting extremely few in number. Mr. Geo. 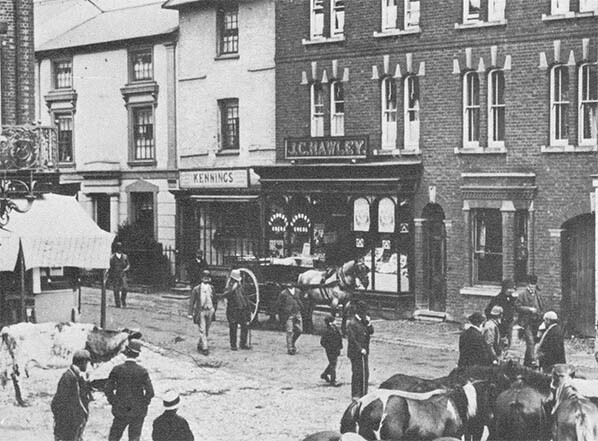 Kennings, whose death we announced last week, had, we believe, been in business from 1844, previous to which he resided in Whitchurch. In the 1851 and 1861 Censuses, he was living in Horn Street. 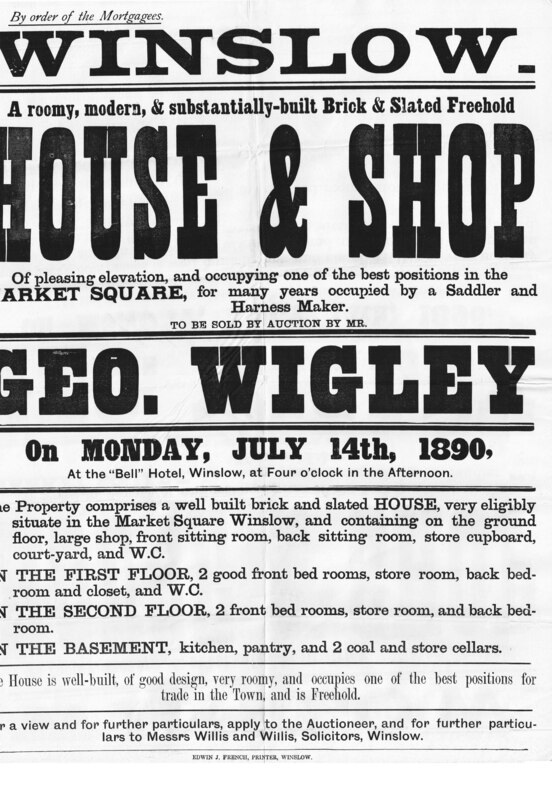 1890 Freehold of the premises sold by Wigleys (click on the image below for a larger version). They also carried out a valuation of the fixtures in the house and shop (Centre for Bucks Studies D/WIG/2/1/23, p.3), listing front shop, back shop, workroom, passage, sitting room, bedroom and attic. Valuation: £5 19s. After the Second World War the shop was run by the Newman family of Granborough, and was Newman's Delicatessen in the 1960s and 70s.